Brooke loved reading the dishy celebrity gossip rag Last Night. That is, until her marriage became a weekly headline. Brooke was drawn to the soulful, enigmatic Julian Alter the very first time she heard him perform "Hallelujah" at a dark East Village dive bar. Now five years married, Brooke balances two jobs—as a nutritionist at NYU Hospital and as a consultant to an Upper East Side girls' school, where privilege gone wrong and disordered eating run rampant—in order to help support her husband's dream of making it in the music world. Things are looking up when after years of playing Manhattan clubs and toiling as an A&R intern, Julian finally gets signed by Sony. Although no one's promising that the album will ever hit the airwaves, Julian is still dedicated to logging in long hours at the recording studio. All that changes after Julian is asked to perform on the Tonight Show with Jay Leno—and is catapulted to stardom, literally overnight. Amazing opportunities begin popping up almost daily—a new designer wardrobe, a tour with Maroon 5, even a Grammy performance. At first the newfound fame is fun—who wouldn't want to stay at the Chateau Marmont or visit the set of one of television's hottest shows? Yet it seems that Brooke's sweet husband—the man who can't handle hot showers and wears socks to bed—is increasingly absent, even on those rare nights they're home together. When rumors about Brooke and Julian swirl in the tabloid magazines, she begins to question the truth of her marriage and is forced to finally come to terms with what she thinks she wants—and what she actually needs. LAST NIGHT AT CHATEAU MARMONT, from best selling author of THE DEVIL WEARS PRADA, Lauren Weisberger, is almost a typical “Star is Born” kind of story. ‘Almost’, because as Weisberger’s many fans know, she is never one to settle for the typical story or ending, and that is why we love to read her work. LAST NIGHT AT CHATEAU MARMONT is built around the way that becoming a celebrity can effect someone but also, how it can change the lives of everyone around them. Brooke is a nutritionist with a successful career, working in New York when she meets Julian Alter, a singer/songwriter trying to make it big in his music career. They almost immediately are attracted to each other and marry soon after. For the first five years, they share their married bliss and become great parents. Brooke works two jobs to support the family so Julian can pursue his musical dream. As if it happened overnight, Julian scores a hit and becomes a rock star instantaneously! As they find themselves in Los Angeles with Julian performing on Jay Leno‘s “The Tonight Show”, their lives are suddenly turned upside down. With this new incredibly glitzy lifestyle, Brooke finds herself quickly left out of the picture and as Julian attracts more aggressive female fans and socializes and works with the hottest young actresses, the paparazzi eat it up. Spending more time away from home than with Brooke and his family, puts an obvious strain on their marriage. The straw for this camel comes, as the headlines read, when Julian is reportedly found “with” another woman bringing Brooke to the point where she must decide if this is the life she really wants or not. With Weisberger giving such depth to both Brooke and Julian from the start, before all the Hollywood hullabaloo, readers become invested in both their lives, knowing them as "real" people and not stereotypes. Emotionally you can understand the position and feelings of both characters as their lives change over time. Their personal struggles and the precariousness of their marriage all lead to an incredible conclusion. Knowing Brooke so well, leads you to wonder what you would do and how you feel about what really happens. How do you feel about the title LAST NIGHT AT CHATEAU MARMONT and what does it signify? How would you handle things if you were in Julian’s shoes? You will find yourself turning the pages to see if Brooke and Julian do what you think they should do or not. I thoroughly enjoyed Lauren Weisberger’s new book and luxuriated in a well written story with great characters and story lines in what could have been just another Hollywood chick-lit run of the mill story. +1 (+2? )MORE ENTRY: COMMENT ON OTHER BOOKS FROM SIMON AND SCHUSTER THAT YOU MIGHT LIKE TO READ BY GOING TO THEIR WEBSITE HERE AND LOOKING AROUND AT ALL THEY HAVE TO OFFER. WHILE THERE, SEE IF YOU CAN NAME ANOTHER BOOK WRITTEN BY AUTHOR LAUREN WEISBERGER. 6 PM, EST, SEPTEMBER 18! I would be interested in reading it, because it sounds like being famous isn't all it is thought to be. It sounds like a good book, I would like to read. Empire of the summer moon sounds like a good book. Everyone worth knowing by lauren weisberger sounds good. From reading about the book and your review, I gather the characters are fully developed so they seem real instead of stereotyped. That is the reason that I would like to read this book. 'Tough Customer'. I would like to read that because she is great at suspense and twists and turns. Another book that Laura Weisberger wrote is 'Chasing Harry'. Would enjoy reading about tinsel town with a little suspense. I love this author! She does such a fantastic job of getting to the pulse of the current entertainment world that so many of us just watch from the sidelines. She does a fantastic job of showing the glamourous but also the dark and dirty aspects of this world. This sounds no different, showing how a happy couple, one of which is an up and coming artist, can turn not so happy when fame and wonderlust takes over. Can't wait to read it! I went to the website and saw Called to Coach by Bobby Bowden (THE Coach). I would love to read this as I am from Tallahassee, FL and went to FSU (along with every single person in my family). To people from Tallahassee, Coach Bowden is the ultimate prize. Would love to hear what he has to say. I have read The Devil Wears Prada by this author and absolutely loved it! Celebrity gossip--I just love books like that, they are usually so diverting! I would like to read Lonesome Dove--I've always heard great things about it and now it's in a 25th anniversary! Lauren also wrote The Devil Wears Prada. I love a novel that has characters with depth who I actually care about and hope will be able to handle or work through whatever comes their way. At S&S website I saw that they are re-releasing Lonesome Dove. I've always wanted to read it and I know someone is doing a read along on their blog soon. 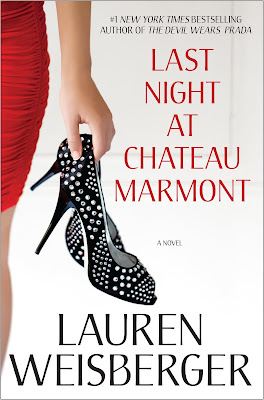 I also saw Chasing Harry Winston and Everyone Worth Knowing on the Lauren Weisberger page at S&S. I would love to win this. I enjoy reading about marital relationships and celebrities and the celebrity lifestyle and this book has both. I would like to read TOUGH CUSTOMER by Sandra Brown. I would like to read her THE DEVIL WEARS PRADA. I saw the movie and loved it. This book sounds like an interesting view of how fame & celebrity can affect your life. I went to the publisher website and I would like to read The Thieves Of Darkness by Richard Doetsch. I saw she wrote The Devil Wears Prada and Everyone Worth Knowing. I like the story of a non-entertainer and an entertainer and how their relationships mesh or not. The Girl Next Door by Patricia MacDonald would be good. She also wrote Everyone Worth Knowing which looks good, too. I saw Devil Wears Prada & loved it so I'm sure I will enjoy reading this. I'd like to read this because it is fun to read about the famous and see that they have as many or more problems than the average person. Empire of the Summer Moon and The Glass Castle look good. She also wrote American Girls About Town, Everyone Worth Knowing and Chasing Harry Winston. What a lovely review. I would love to read this book if only to see the ending and how this all plays out. I am anxous to read Clockwork Angel as I have read good things about this book. It would be interesting to see a story like this from the inside. Usually we are on the outside watching it play out in the media. I'd love to read Little Bee by Chris Cleave. Knowing a few people to whom this sort of thing has actually happened, I'm very curious about the choices the characters/author make. The Devil Wears Prada by Lauren Weisberger was a great read and this book must be great, too. S&S website has Touch Customer by Sandra Brown, Now You See Her by Joy Fielding and I'll Walk Alone by Mary Higgins Clark are all books that I would love to read because these authors are outstanding. I am an email subscriberand a google follower.